A little over a month ago, I said goodbye to my mother. She passed away after a stroke some time earlier that left her in pain and paralyzed on the left side. Her passing took away the pain and the struggled that were the end of her life. So it truly was a blessing. What I want to talk a little about here is my mom the character, because she was one. There were so many facets to her. She was my model for the caring and protective mom. I have used her in so many books. She also exasperated me at times, and I tend to pull that out of my pocket as well. Mom was also fun and had a sense of humor and I think that that's what I'm going to remember her for. 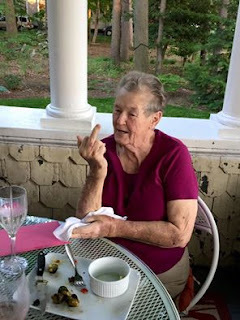 See mom was truly a character and I have the picture of her flipping my brother off when he made her eat a Brussel sprout to prove it. I think that's how I'm going to remember her most of all!!!! So sorry for your loss, Andrew. She sounds like a wonderful woman. You were blessed to have her. My kids tell me that's how they will remember me, too. They learned to swear by driving in the car with me, and they tell me they'd compare afterwards, what they'd heard, and what the words might mean, as they played in the sandbox. I guess as an English teacher, it was my responsibility to teach them how to use ALL English words, not just the long words they also tease me about. I'm sorry for your loss, but hope that your good memories will replace the sad ones, and that you will always hold her in your heart.